It is widely believed that the stress of puffing up reduces the lifespan of a puffer fish. Causing your puffer to puff for your entertainment is not recommended. Alternatively, you can try to scare your puffer by quickly darting toward the tank. This doesn't always work, especially if the fish recognizes you. Some puffers adapt to use their puffing as a way to ask for food. They may puff up to get your attention when they haven't been fed in a while. 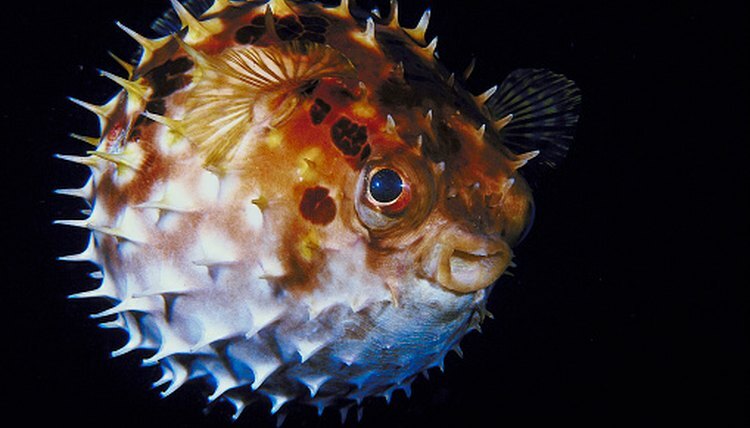 Puffer fish puff up as a defense mechanism, as a way to scare off rivals and as a way to attract a mate. The body of a puffer fish can swell to over two and a half times its original size as a way to scare off predators. Any time a puffer fish is severely frightened it will puff itself up to look larger. This is very stressful on the fish. It is not recommended to provoke the fish to puff up but there are some occasions when it may be medically necessary. Place a fish net in the water upside down (with the handle end in the tank). Some puffers have sharp spikes that can get caught in a net so keep the netting out of the water. Tap the puffer with the handle of the net. It will probably just swim away. Follow the puffer with the net, continuing to tap it. This will eventually either scare or anger the fish into puffing up. It may not puff up all the way at first so you may need to tap it again.